Wash the potatoes and cut them into smaller chunks, roughly 2” x 2”. Place the potatoes into a pot and add enough cold water to cover them. Bring to a boil. Keep an eye on the pot as the potatoes may start to boil over if your pot is too small. Reduce heat to a slow boil and boil for about 15 minutes. Check the potatoes a few times during the cook period with a fork. You want them to be soft enough to easily pierce with a fork. Drain the water when the potatoes are ready. Add the milk, butter, salt and pepper to the potatoes in the pot. This is the step where you’ll add in extra bits to spice things up, or you can continue if you want your potatoes plain. 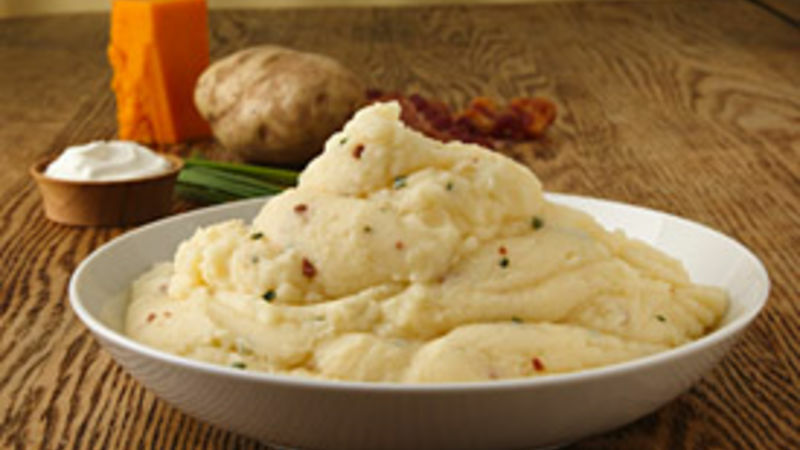 Using a hand or electric beater, beat the potatoes until they are mashed to a fine consistency. Boil potatoes with the skin on or off, but remember, there will be bits of skin in your mashed potatoes if you leave it on.